Hey guys, Tac here with a thread that shows all the GKNOVA6 documents that Carbon got in the briefcase in May of last year. I hadn't heard of anyone scripting these, and apparently neither had Alpha, so I stepped in and did these for him. It took quite a long time to make this thread with all the indentations and just general typing/scripting it took, so I hope you all take advantage of this thread and use it to help make connections. 55,563 characters later, I guess that's all I have to say! With that, here are the images of the documents as well as my scripting, if you find any errors please comment with the error. One thing I will mention is that some of the documents do have misspellings and I did not correct them, I just typed it exactly how it was on the documents. 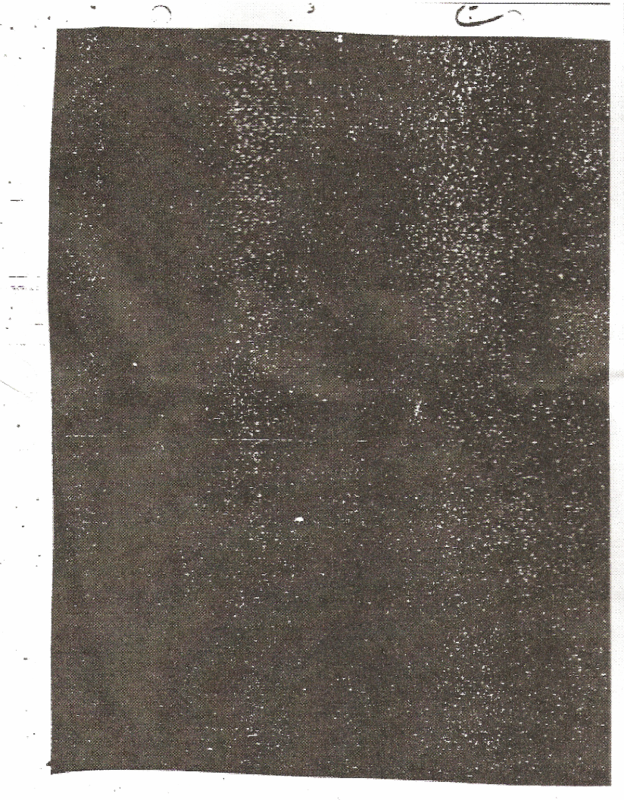 Also, ████████ means that it was REDACTED in the document, so we can't see what it says. Enjoy guys! 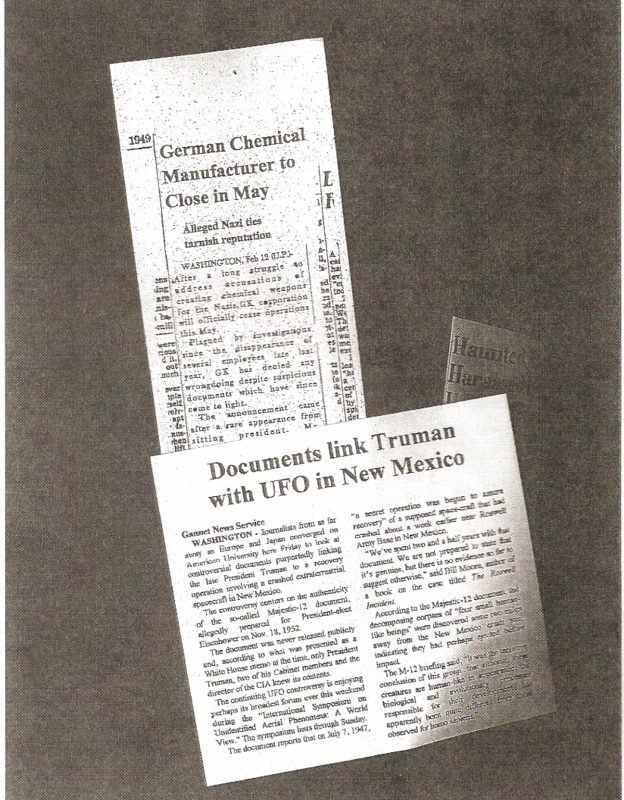 WASHINGTON - Journalists from as far away as Europe and Japan converged on American University here Friday to look at controversial documents purportedly linking the late President Truman to a recovery operation involving a crashed extraterrestrial spacecraft in New Mexico. 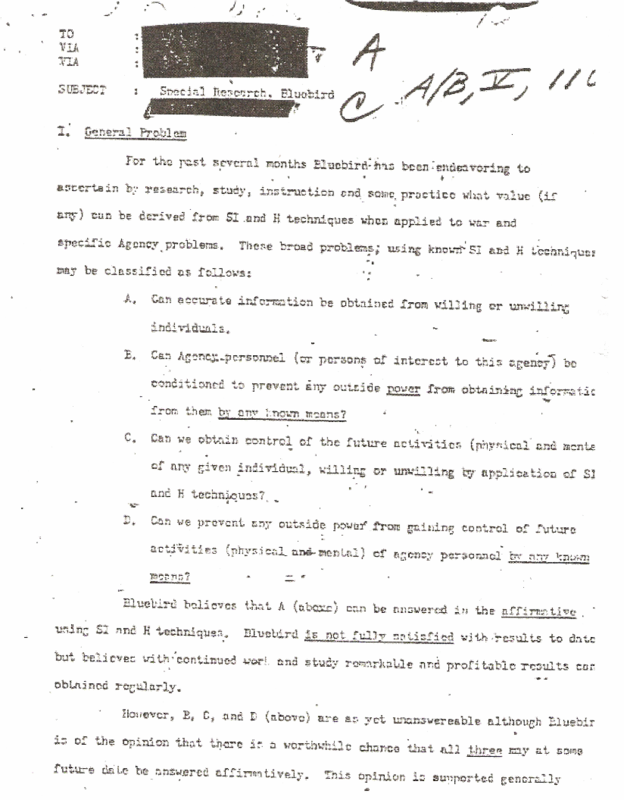 The controversy centers on the authenticity of the so-called Majestic-12 document, allegedly prepared for President-elect Eisenhower on Nov. 18, 1952. 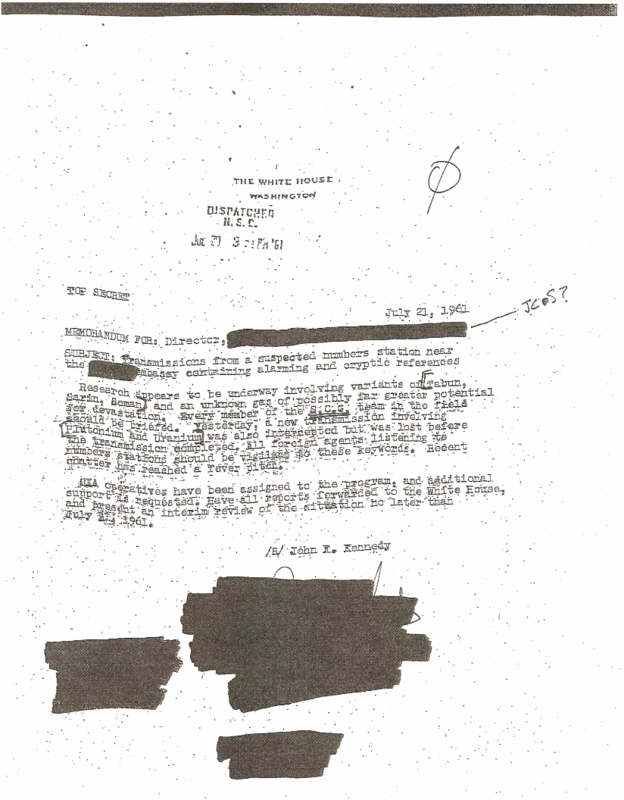 The document was never released publicly and, according to what was presented as a White House memo at the time, only President Truman, two of his cabinet members and the director of the CIA knew its contents. The continuing UFO controversy is enjoying perhaps its broadest forum ever this weekend during its "International Symposium on Unidentified Aerial Phenomena: A World View." The symposium lasts through Sunday. 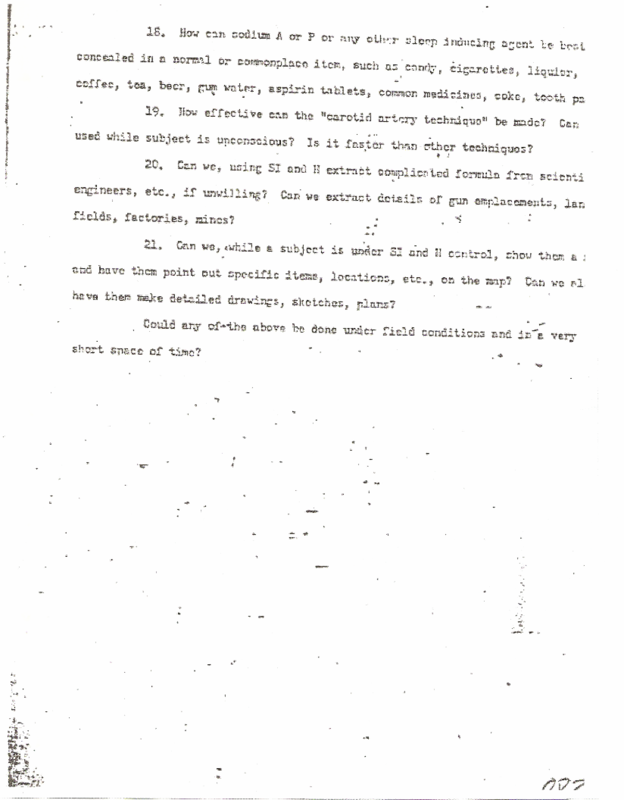 The document reports that on July 1, 1947, "a secret operation was begun to assure recovery" of a supposed space-craft that had crashed about a week earlier near Roswell Army Base in New Mexico. 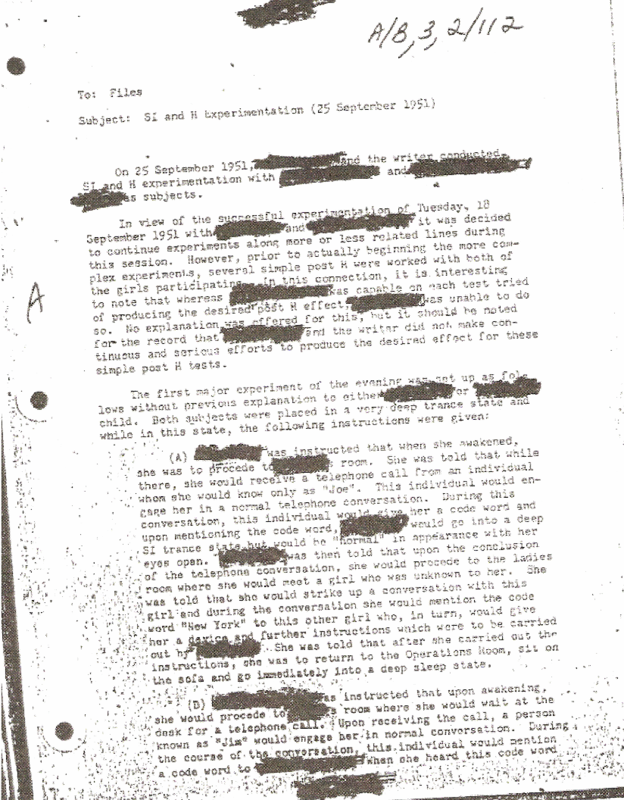 "We've spent two and a half years with that document. We are not prepared to state that it's genuine, but there is no evidence so far to state otherwise," said Bill Moore, author of a book on the case titled The Roswell Incident. 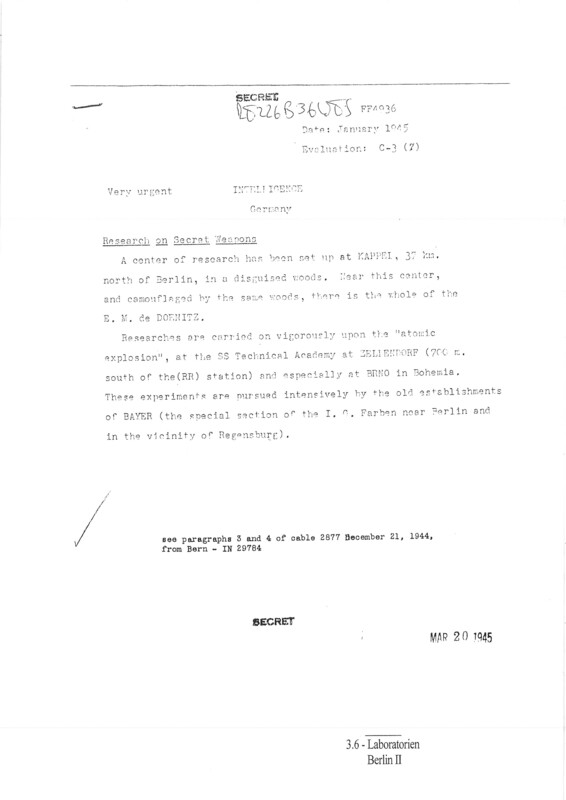 According to the Majestic-12 document, the decomposing corpses of "four small human-like beings" were discovered some two miles away from the New Mexico crash site, indicating they had perhaps ejected before impact. The M-12 briefing said; "It was the tentative conclusion of this group... that although these creatures are human-like in appearance, the biological and evolutionary processes responsible for their development has apparently been quite different from those observed for homo-sapiens." 2. What Characterizes a Good Operator? 5. Can a Subject be Hypnotized Against His Will? We are on schedule thus far. Stability has been out biggest hurdle. The effects, however, are promising and yield results beyond that which was requested. a) Stability is still an issue - we are hoping version 4 will be stable. Reference - Stability Report No. NOVA.SR 2010032. Stress investigations and Long-Term-Testing with trial and batches to derive the shelf-life for batches in phase II. Further testing into modes of dispersion are currently underway - Initial findings are positive and lead us to believe only slight modifications will be needed retrofit current chemical dispersion techniques. 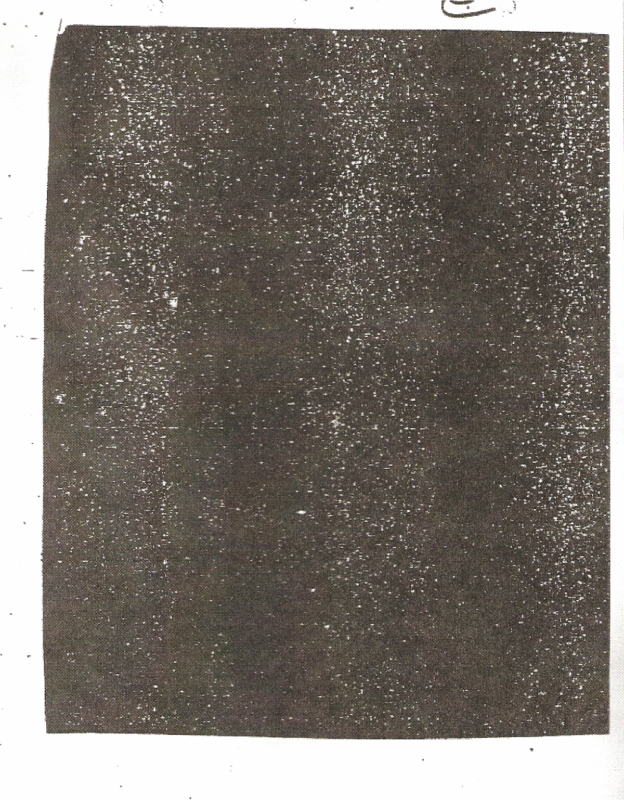 Reference - Dispersion Report No. NOVA.DR 0510032.
c) Long term storage is in phase III - The Containers are currently being tested in various environments. Phase III includes Long-term testing at 25°C/60% r.h. for confirmation of findings. Reference - Stability Report No. NOVA.SR 2010022.
d) Means of protection for handlers and handling protocols must be investigated. Tests with chimpanzees show how current protocols are insufficient. Suggest moving to human trials to speed research. Reference - Trial Report No. NOVA.TR 1915032.
e) Current facilities are inadequate - The scope of this project has vastly increased and as such out needs have outgrown our current faculty. The incident last month only reiterates our need for a more permanent and isolated laboratory. Reference - Incident Report No. NOVA.IR 0002036. CIA operatives have been assigned to the program, and additional support is requested. 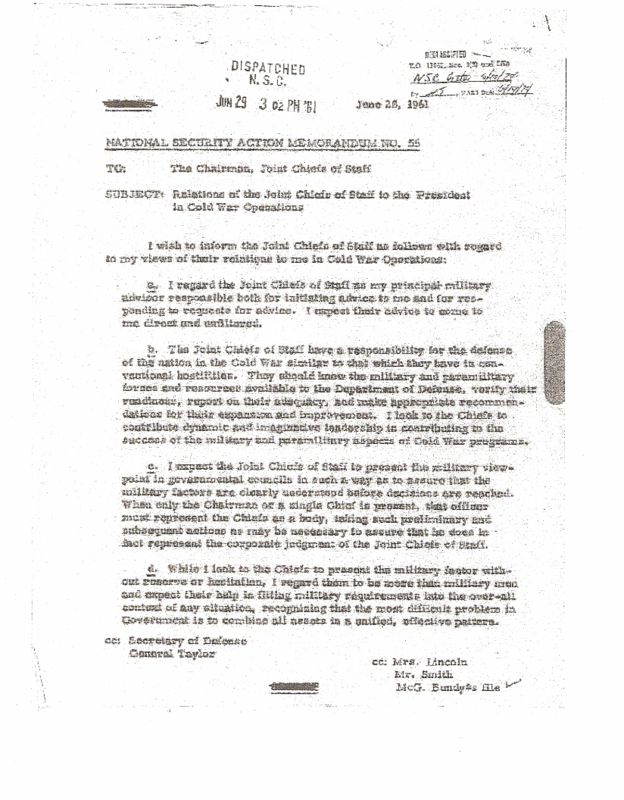 Have all reports forwarded to the White House, and present an interim review of the situation no later than July 31, 1961.
available to them. This is one of the reasons ESP experiments are so difficult. But it may still be possible to learn a good deal about the phenomenon, even if learning studies should fail. For it is possible to vary the experimental paradigm to discriminate between various models for the operation of this phenomenon, such as: ESP occurs sporadically but gives perfect information; ESP always occurs and multiplies chances of success by a constant factor; ESP tells the subject one of the things the target is not; ESP, when it occurs, answers a question of the form- is the target an X?. In addition to psi-models, it will also be necessary to introduce models which provide more sensitive estimate of ESP. For example, target material will be introduced whereby guesses instead of being of the 'all or nothing' type can be more or less right. Again, a number of different p values will be introduced and intermixed to imitate real life situations. a. I regard the Joint Chiefs of Staff as my principal military advisor responsible both for initializing advice to me and for responding to requests for advice. I expect their advice to come to me direct and unfiltered. b. The Joint Chiefs of Staff have a responsibility for the defense of the nation in the Cold War similar in that which they have in conventional hostilities. They should know the military and paramilitary forces and resources available to the Department of Defense, verify their readiness, report on their adequacy and make appropriate recommendations for their expansion and improvement. I look to the Chiefs to contribute dynamic and imaginative leadership in contributing to the access of the military and paramilitary aspects of Cold War programs. c. I expect the Joint Chiefs of Staff to present the military viewpoint in governmental councils in each way as to assure that the military factors are clearly understood before decisions are reached. When only the Chairman or a singe Chief is present, that officer must represent the chiefs as a body, taking such paramilitary and subsequent actions as may be necessary to assure that he does in fact represent the corporate judgment of the Joint Chiefs of Staff. d. While I look to the Chiefs to present the military factor without reserve or hesitation, I regard them to be more than military men and expect their help in fitting military requirements into the over-all context of any situations, recognizing that the most difficult problem in Government is to combine all assets in a united, effective pattern. the recovered NOVA report ████████3. details the effects of formula II on livestock. 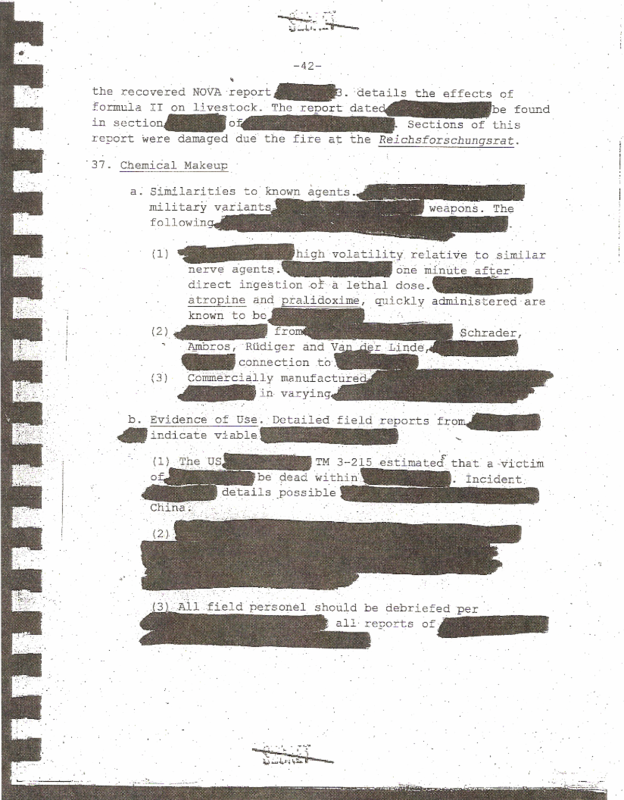 The report dated ████████ be found in section ████████ of ████████. 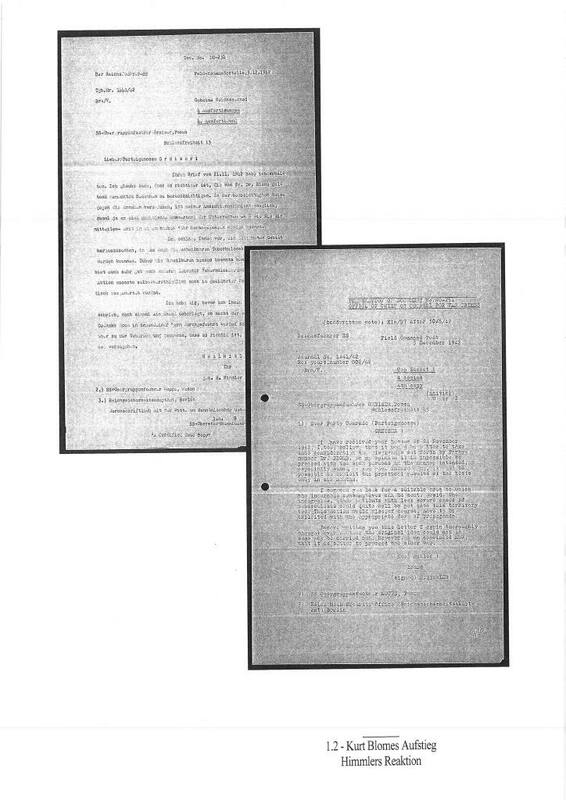 Sections of this report were damaged due to the fire at the Riechforschungsrat. a. Similarities to known agents ████████ military variants ████████ weapons. The following ████████. (1) The US ████████ TM 3-215 estimated that a victim of ████████ details possible ████████ China. encountered an unidentified gas which attacked respiratory, cutaneous and nervous systems with debilitating but non-lethal effect. 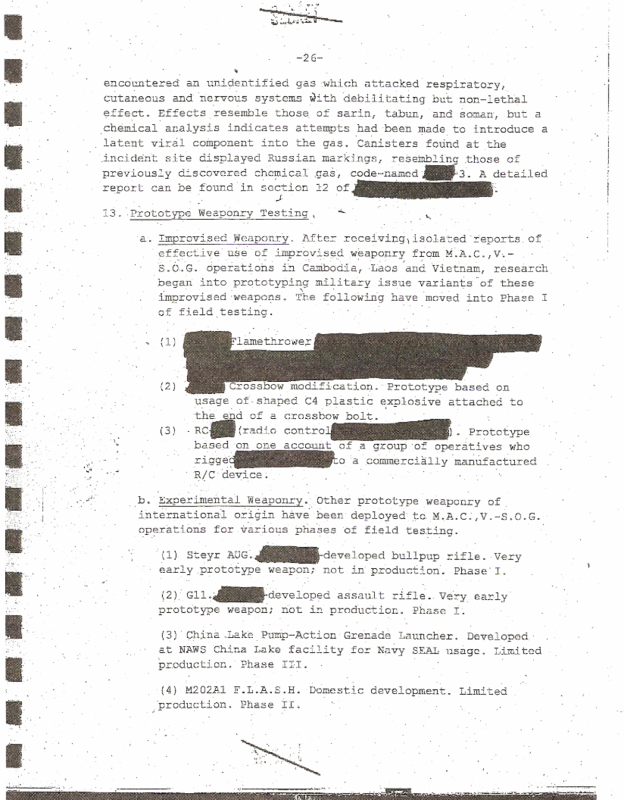 Effects resemble those sarin, tabun, and soman, but a chemical analysis indicates attempts had been made to introduce a latent viral component into the gas. Canisters found at the incident site displayed Russian markings, resembling those of previously discovered chemical gas, code-named ████████-3. A detailed report can be found in section 12 of ████████. a. Improvised Weaponry. After receiving isolated reports of effective use of improvised weaponry from M.A.C,V.-S.O.G. operations in Cambodia, Laos, and Vietnam, research began into prototyping military issue variants of these improvised weapons. The following have moved into Phase I of field testing. (2) ████████ Crossbow modification. Prototype based on usage of shaped C4 plastic explosive attached to the end of a crossbow bolt. (1) Steyr AUG. ████████-developed bullpup rifle. Very early prototype weapon; not in production. Phase I. (3) China Lake Pump-Action Grenade Launcher. Developed at NAWS China Lake facility for Navy SEAL usage. Limited production. Phase III. For a matter of record, immediately after the operation begun it was noted that a member of the charforce was cleaning the floor in the ladies room and subsequently, both ████████ and ████████ had to be placed at once again in a trance state and instructions changed from the ladies room to Room 3. Before the girls were awakened, they were given instructions [iLLEGIBLE]. 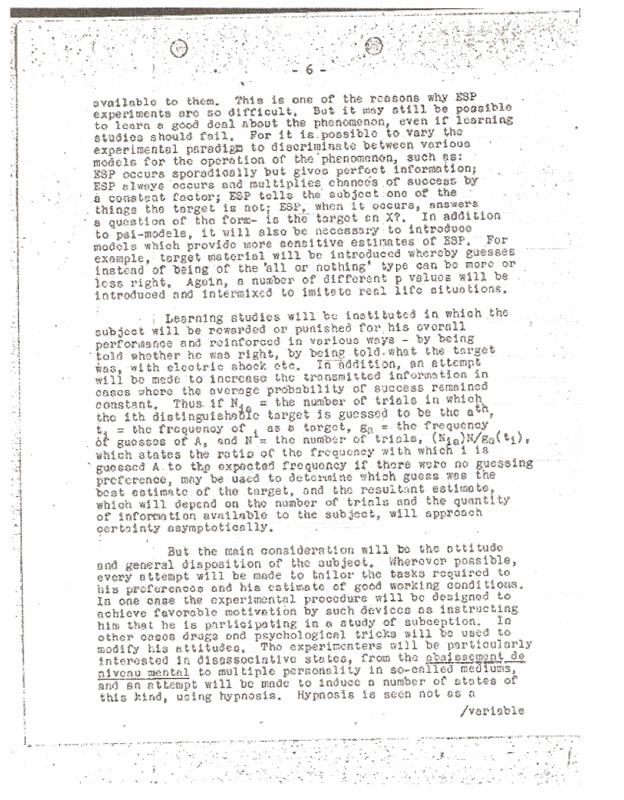 In view of the successful experimentation of Tuesday, 10 September 1951 with ████████ and ████████ it was decided to continue experiments along more or less related lines during this session. However, prior to actually beginning the more complex experiments, several simple post H were worked with both of the girls participation. In this connection, it is interesting to note that whereas ████████ was capable on each test tried of producing the desired post H effect, ████████ was unable to do so. No explanation was offered for this, but it should be noted for the record that ████████ and the writer did not make continuous and serious efforts to produce the desired effect for these simple post H tests. Based on what I said, I judge that tho████████ use an elaborate conditioned-reflex procedure in their "brain-washing". Even so, hypnosis may be able on the one hand to pre-condition a subject against the pressures, or after the fact to help undo the damage. One of the foremost U.S. laboratory experimenters with hypnosis on one occasion (1939) "converted" a campus atheist to a devout believer. The same operator was on the point of trying a similar experiment in reverse with a divinity student when the university authorities forbade further tests. Before the "conversion" to religion through hypnosis had been erased by negative suggestions, the subject had for over two weeks given every sign of being a dedicated religious convert. He was restored to his former disbelief. I know of no way of estimating how long the hypnotically imposed orientation would have endured; but once implanted, of course, circumstances tended to reinforce it. Given a subject who could be converted at all, the new orientation might become permanent, the experimenter felt. There is no recorded instance in which a hypnotized subject has failed to awaken. Not one subject in a hundred will "sleep" beyond the hypnotist's suggestion, "In a moment I am going to awaken you. You will feel fine, happy and cheerful. There will be no ill effects--no headaches, drowsiness, stiffness or other discomfort. I am going to count to three, and at the count of three I will snap my fingers and you will be completely awake. One--you are sleeping much more lightly. Two--almost awake now. Three--(snap!) --you are wide awake! If for any reason a subject does not desire to awaken (usually connected with a wish to continue the pleasure and comfort of release from anxiety and worry which accompanies hypnosis, apparently), there are several other techniques to be tried. 3. 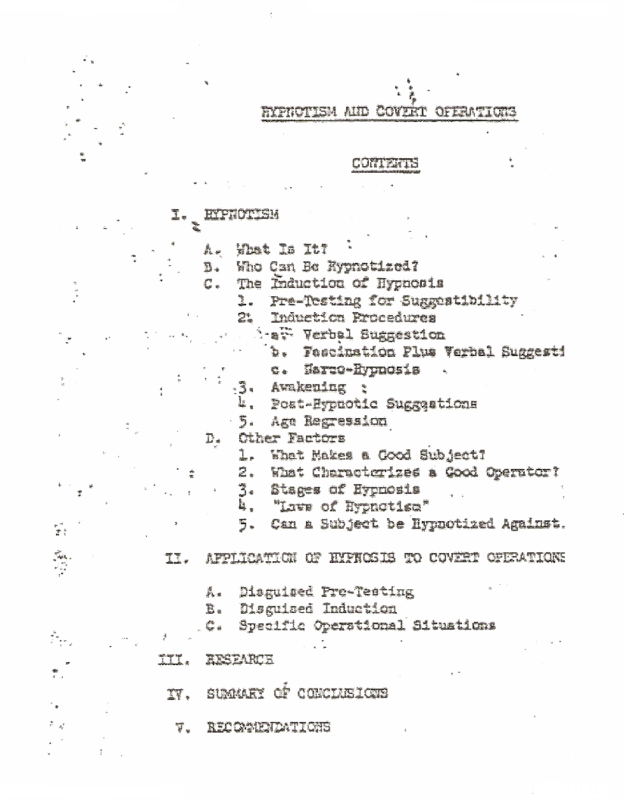 ████████ and some other psychiatrists do not agree, at least insofar as the therapeutic use of narco-hypnosis is concerned. the statements in this paper are justified: DCI, D/DCI, ████████, DD/P, ████████. 3. 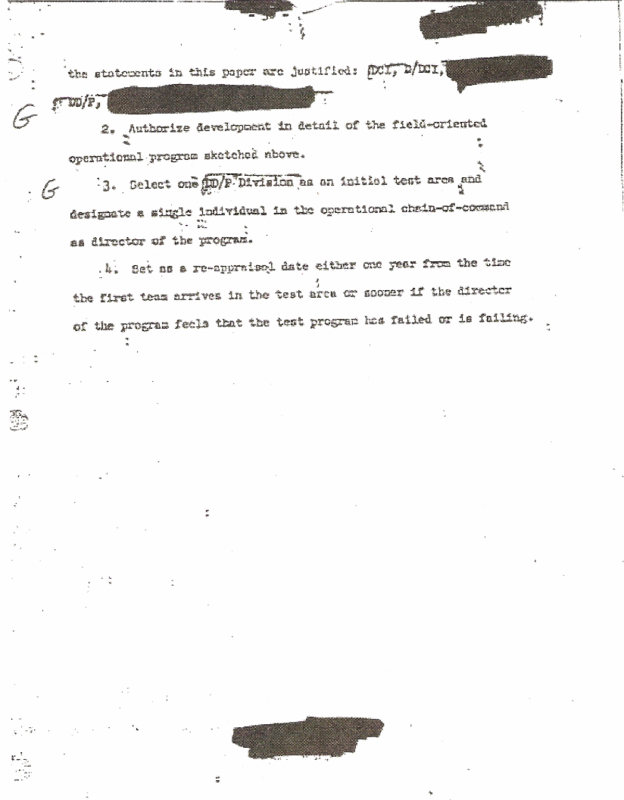 Select one DD/P Division as an initial test area and designate a single individual in the operational chain-of-command as director of the program. 1. Approximately 6% of the TSS research and development effort lies in two highly sensitive fields in which it is not possible to conduct the work through the customary contracts for security reasons and other considerations. 4. All controls established in PRC approval of the original Research Program (other than signing of a contract) would remain unchanged. Periodic financial and progress reports will be made. All documents will be retained by TSS. 5. No new funds are involved. This procedure would apply to funds previously approved for research. 1. 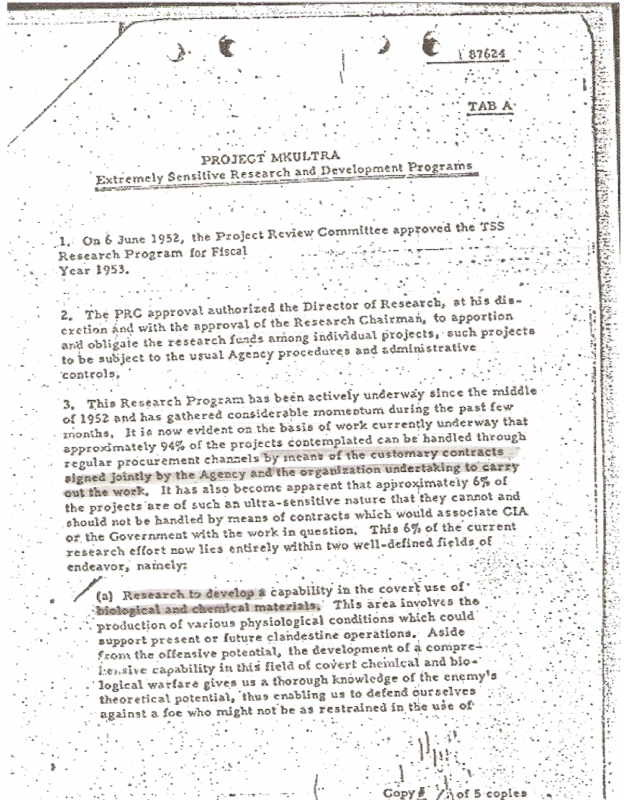 On 6 June 1952, the Project Review Committee approved the TSS Research Program for Fiscal Year 1953. 4. 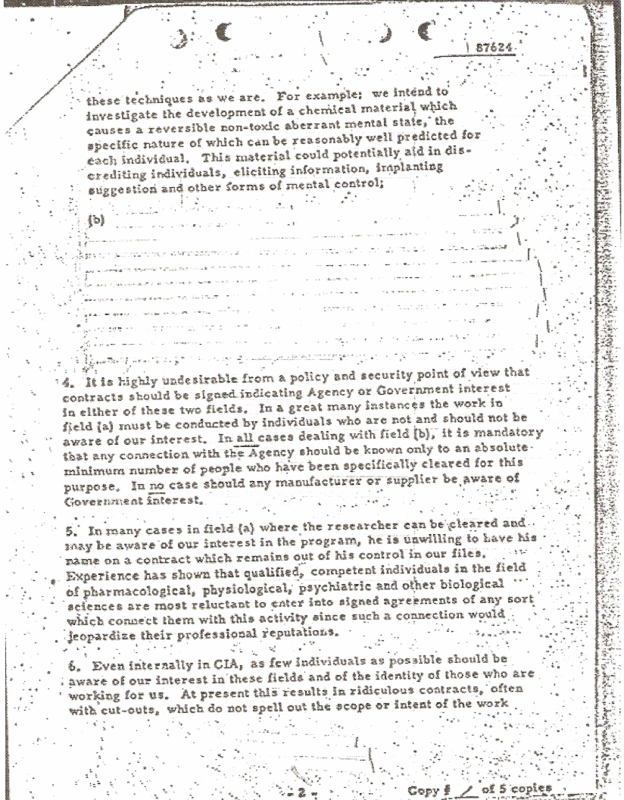 It is highly undesirable from a policy and security point of view that contracts should be signed indicating Agency or Government interest in either of these two fields. In a great many instances the work in field (a) must be conducted by individuals who are not and should not be aware of our interest. In all cases dealing with field ( , it is mandatory that any connection with the Agency should be known only as an absolute minimum number of people who have been specifically cleared for this purpose. In no case should any manufacturer or supplier be aware of Government interest. 5. In many cases in field (a) where the researcher can be cleared and may be aware of our interest in the program, he is unwilling to have his name on a contract which remains out of his control in our files. 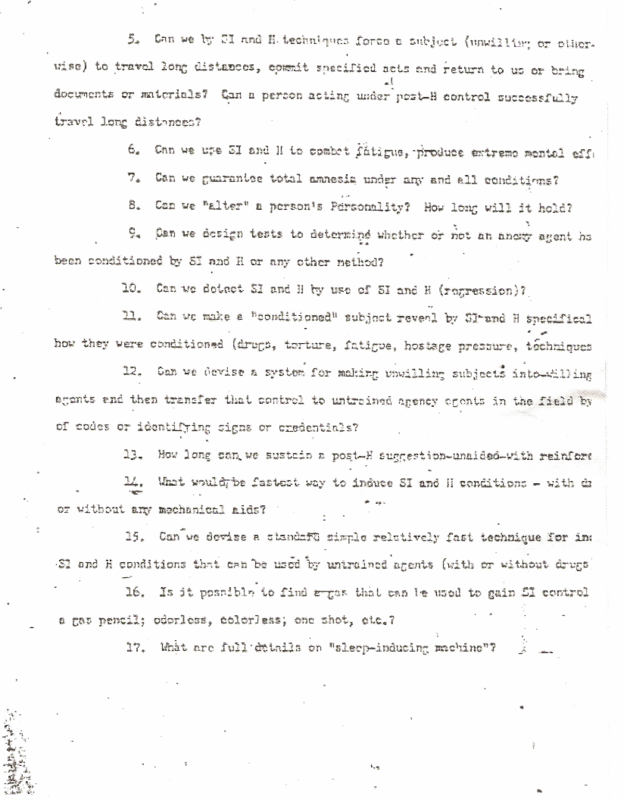 Experience has shown that qualified, competent individuals in the field of pharmacological, psychiatric and other biological sciences are most reluctant to enter into signed agreements of any sort which connect them with this activity since such a connection would jeopardize their professional reputations. A. Can accurate information be obtained from willing or unwilling individuals. B. 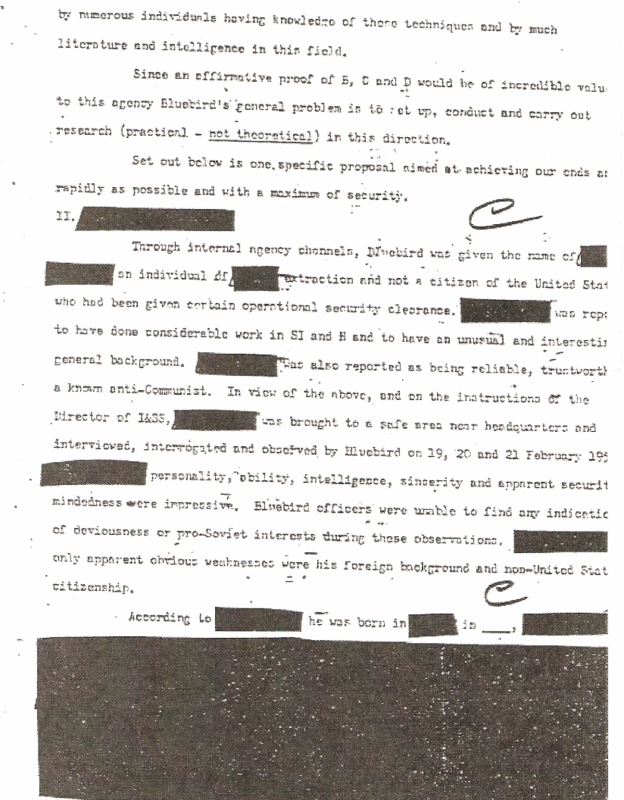 Can Agency personnel (or persons of interest in this agency) be conditioned to prevent any outside power from obtaining information from them by any known means? C. Can we obtain control of the future activities (physical and mental) of any given individual, willing or unwilling by application of SI and H techniques? D. Can we prevent any outside power from gaining control of future activities (physical and mental) of agency personnel by any know means? Bluebird believes that A (above) can be answered in the affirmative using SI and H techniques. Bluebird is not fully satisfied with results to date but believe with continued work and study remarkable and profitable results can be obtained regularly. by numerous individuals having knowledge of there techniques and by much literature and intelligence in this field. Set out below is one specific proposal aimed at achieving our ends as rapidly as possible and with a maximum of security. According to ████████ he was born in ████████ in ____, ████████. For matter of record ████████ was briefed ion the security aspects of B work and cautioned against all and any discussion outside concerning these matters. 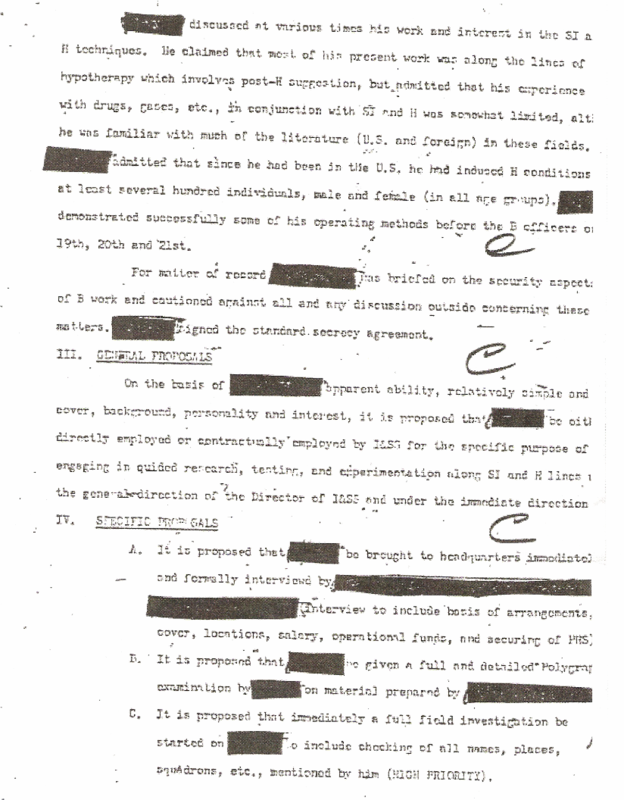 ████████ signed the standard secrecy agreement. names, places, squadrons, etc., mentioned by him (HIGH PRIORITY). 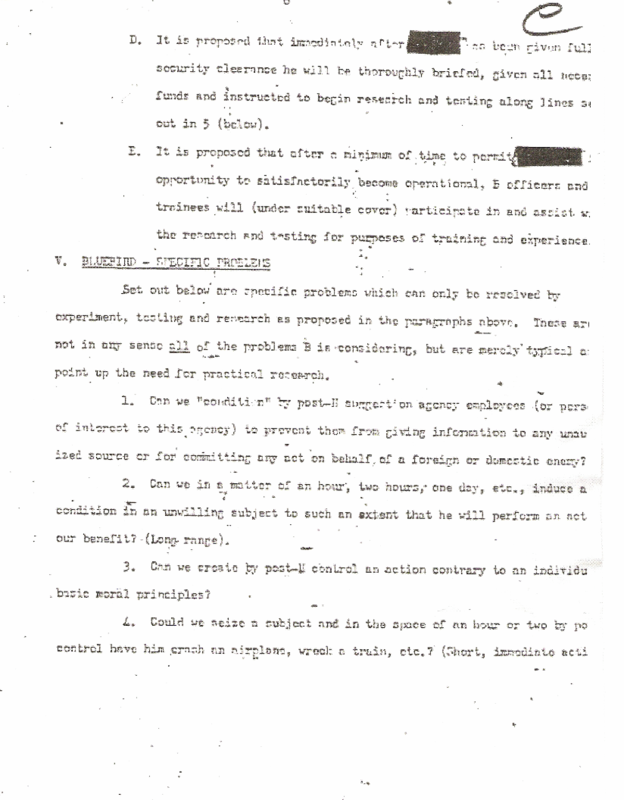 D. It is proposed that immediately after ████████ has been given full security clearance he will be thoroughly briefed, given all necessary funds and instructed to begin research and testing along lines set out in 5 (below). E. It is proposed that after a minimum of time to permit ████████ opportunity to satisfactorily become operational, B officers and trainees will (under suitable cover) participate in and assist with the research and testing for purposes of training and experience. Set out below are specific problems which can only be resolved by experiment, testing and research as proposed in the paragraphs above. These are not in any sense all the problems B is considering, but are merely typical ? point up the need for practical research. 1. Can we "condition" by post-H suggestion agency employees (or persons of interest to this agency) to prevent them from giving information to any unauthorized source or for committing any net on behalf of a foreign or domestic enemy? ]2. Can we in a matter of an hour, two hours, one day, etc., induce a condition in an unwilling subject to such an extent that he will perform an not? our benefit (Long range). 3. Can we create by post-H control an action contrary to an individuals basic moral principles. 6. Can we use SI and H to combat fatigue, produce extreme mental efficiency? 9. Can we design tests to determine whether or not an enemy agent has been conditioned by SI and H or any other method? 11. Can we make a "conditioned" subject reveal by SI and H specifically how they were conditioned (drugs, torture, fatigue, hostage pressure, techniques)? 12. Can we devise a system for making unwilling subjects into willing agents and then transfer that control to untrained agency agents in the field by means of codes or identifying signs or credentials? 13. How long can we sustain a post-H suggestion unaided with reinforcements? 14. What would be fastest way to induce SI and H conditions - with drugs or without any mechanical aids? 15. Can we devise a standard simple relatively fast technique for inducing SI and H conditions that can be used by untrained agents (with or without drugs)? 16. Is it possible to find a gas that can be used to gain SI control ? a gas pencil; odorless, colorless; one shot, etc.? 17. What are full details on "sleep-inducing machine"? 18. How can sodium A or P or any other sleep inducing agent be best concealed in a normal or commonplace item, such as candy, cigarettes, liquor, coffee, tea, beer, gum water, aspirin tablets, common medicines, coke, tooth paste, etc.? 19. How effective can the "carotid artery technique" be made? Can it be used while subject is unconscious/ Is it faster than other techniques? 20. Can we, using SI and H extract complicated formula from scientists, engineers, etc., if unwilling? Can we extract details of gun emplacements, lan? fields, factories, mines? ]21. Can we, while a subject is under SI and H control, show them a map and have them point out specific items, locations, etc., on the map? Can we also have them make detailed drawings, sketches, plans? Can any of the above be done under field conditions and in a very short space of time? @Tac, I just re-read this thread. What you have done formating into transcript form is truely amazing. So much time must have been spent doing this. I'm glad you updated this thread when you did. A true Gem on Codz. Brains, Brains, Brains! Just a heads up that this thread is going to be reformatted to better fit the site. If anyone still looks at this, go you!